While the attention tends to be focused elsewhere, it's a well known fact that the accessories are what really make an outfit come together. Southwest Silver Gallery is here to provide for all of your Native American accessory needs and desires, offering a spectacular collection of Beaded Eye Glass Holders, Hair Barrettes, Silver Money Clips and Tie Tacks to help add the sparkle and pizazz that your ensemble has been missing. Along with the other authentic, bestselling products we have to offer at Southwest Silver Gallery, our Native American accessories consist of the finest items on the market and are characterized by exquisite turquoise jewelry that is customary to the majority of our gallery. Wearing glasses is certainly nothing new, but wearing glasses in style? That's what we hope to help with. Our assortment includes beaded turquoise eyeglass holders, beaded gemstone eyeglass holders and beaded sunglass holders, so whether you're delighting in a good read, or enjoying a day in the sun, we've got you - and your glasses - covered. 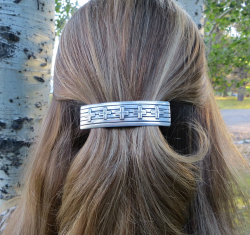 Our other Native American accessories include our authentic hair barrettes, which are handmade and sourced from the finest quality silver. These include silver hair barrettes, silver hair combs, ponytail holders, hair sticks, turquoise barrettes, turquoise ponytail holders, Native American barrettes and hair pieces. Many of these are of the sterling silver variety, and contain 7.5 percent of materials other than copper. This provides the product with the strength and functionality necessary for it to be useful, while also preserving its ductility and precious appearance. 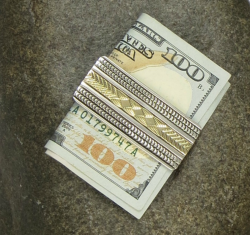 From turquoise money clips, to silver money clips, to Navajo money clips, to Hopi money clips and Native American money clips, Southwest Silver Gallery offers a wealth of options for you to keep your money nice and organized with one of our authentic money clips. Whether you're a fan of sterling silver, turquoise, or even a gold and silver combination, we're confident you will be able to find the money clip that is absolutely perfect for your style. At Southwest Silver Gallery, we are known for our elegant collection of turquoise jewels, and our Native American accessories are no exception, as evidenced by our assortment of tie tacks. 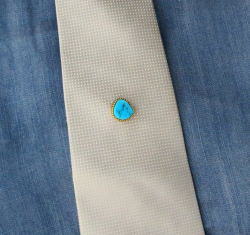 Our offerings include men's silver tie tacks and turquoise tie tacks, as well as Native American tie tacs. From the gorgeous set of hair on your head, all the way down to your toes, there's an accessory out there with your name on it, and we have it here at Southwest Silver Gallery! Explore our vast collection today!